In this Ezmo Build Guide, we provide an overview of his strengths, abilities, Battlerites and matchups. In this Sirius Build Guide, we provide an overview of his strengths, abilities, Battlerites and matchups. In this Rook Build Guide, we provide an overview of his strengths, abilities, Battlerites and matchups. In this Varesh Build Guide, we provide an overview of his strengths, abilities, Battlerites and matchups. Varesh is a complex, and challenging Champion that requires a great deal of skill and practice. He isn’t flashy, doesn’t look like he’s achieving much, doesn’t have a ton of mobility, has a relatively slow playstyle, and yet he’s incredibly oppressive when played correctly. With a kit that’s brimming with utility and control, Varesh can boss most match-up’s if he not only lands his attacks, but repeatedly silences and slows enemy players. A being formed by the energies of others. Varesh uses his power to weaken and disrupt his enemies. By combining his powers he is able to unleash devastating attacks. With most of his kit revolving around snaring and silencing enemies, it’s more than possible to shut down a single Champion for very lengthy periods of time. With timing, he’s also incredibly hard to handle, as his counter combined with his personal shielding (and self healing on his basic attacks) ensures he can survive a fair amount of punishment. Whether in Arena or Talon Island (Battlerite Royale), Varesh is a Champion that’s to be feared - if in the hands of an experienced player. Hand of Corruption (LMB) - Varesh’s basic attack doesn’t just provide a small amount of healing, but it also deals high single target damage while inflicting Corruption. With Varesh lacking mobility, he relies on applying Corruption - and triggering it with Shatter - in order to keep enemies slowed. Not only does this make his basics easier, but ensures subsequent use of Shatter is also easier to land. Ideally, you want to trigger Corruption as soon as possible, and to keep the debuff up as long as you’re able. Hand of Judgement (RMB) - Hand of Judgement is the sexxed up version of Hand of Corruption, and applies his second debuff. When triggered by Shatter, it will silence the foe affected. If you can combine Hand of Judgement and Corruption, and trigger both at the same time, most Champions can struggle to achieve anything. The slow plus silence locks down Champions to the point where they’re often a free kill, especially if they’ve already used their “out”. Inhibitors Guard (Space) - Inhibitors Guard is a simple ability that provides shielding, absorbing a fair amount of damage. Whether it’s used to mitigate incoming burst, or to allow Varesh to trade basic attacks versus an opponent, its value is ensuring you take less damage while still being able to deal it. Its cast time is pretty much instant, and it can be used on an ally even if you don’t have line of sight. Just be conscious not to waste Inhibitors Guard unless under serious pressure: the cooldown is simply too long to waste. Wuju (Q) - An undeniably powerful component of Varesh’s kit, Wuju provides mobility, as well as a knockback. Depending on which debuff you have active on an enemy, Wuju will consume it. In an ideal situation, you’ll have your counter triggered when maintaining both Judgement and Corruption. If need be, it’s also worth using Wuju just to escape completely and return back to your team, as it’s down to you where your reappear. Finally, if you’re under pressure from a cleave attack (such as Iva’s Flamethrower) be sure to cancel-cast Wuju by pressing C, otherwise you’ll remain stationary and stomach the full damage. Shatter (E) - Shatter is the cornerstone of Varesh’s kit and the key reason why he’s so strong. Shatter facilitates the debuff consumption of his LMB and RMB, allowing him to snare and/or silence anyone he triggers. Shatter is challenging to use, as it has a cast time, but also takes a brief moment to detonate. Taking into account player movement, where to cast shatter, while timing it so you make use of your debuffs is largely where Varesh’s skill ceiling comes from. Failing to land Shatter repeatedly will severely limit your potency: go practice! Kinetic Energy (R) - Providing Varesh with his only immediate mobility, Kinetic Energy allows him to dash forwards while leaving a Shatter shard under enemies. If you’ve hit one or more with your debuffs, and want to instantly trigger them in an aggressive manner, use this as soon as possible. Just be conscious of the fact if you do dive deep with this, you should have Wuju or Inhibitors Guard ready to escape with. Hand of Punishment (Shift + RMB) - As your first EX ability, Hand of Punishment is incredibly important, as it allows Varesh to apply Corruption and Judgement debuffs at the same time, from a single shot. Not only that, but landing the ability also provides Varesh with a quick dose of minor healing. What’s important about Hand of Punishment is the fact it allows Varesh to quickly shutdown a single Champion if he immediately follows up with Shatter. Just be aware that the cast time on the ability is fairly long, and skilled players will block/counter it if you don’t bait with cancel-casting. Crush (Shift + E) - Crush is a sexxed up version of Shatter, but instead of the area triggering the debuffs of Corruption and Judgement, it explodes knocking enemies back. With the radius of Crush being larger than Shatter, it’s easier to land and also buys Varesh a little bit of breathing room against melee Champions if he’s out of his counter/shield. Power Combined (F) - Probably one of the most potent Ultimates in the game, Power Combined allows Varesh to become immaterial and travel three times through enemy players. Each time he does, he’ll apply Corruption and Judgement. As long as he hits enemies during each cycle of his animation, the Ultimate can deal massive damage. 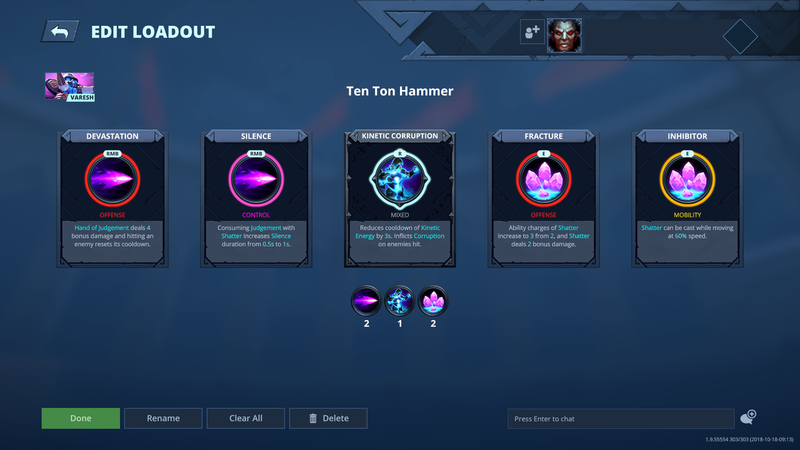 Unsurprisingly, if you do manage to tag the entire enemy team with your debuffs, you can then follow up with Shatter/Crush or Kinetic Energy for immediate lockdown. These Hero Threat Levels (1 being lowest threat and 10 being highest threat) are to help you determine which enemy Heroes can give you a headache. For the Heroes listed here, take extra care as they're particularly dangerous for Varesh. Ezmo: His speed, rapid attacks, ability to shield himself and his long ranged poke, as well as his EX cleave, allows him to avoid your abilities, and land his. 1. It's incredibly important that you constantly apply your Hand of Corruption debuff to enemies. Making use of its snare when shattered allows Varesh to kite with ease. 3. Hand of Judgement has a massive range, but a fairly long wind-up. If you aren't going to land it, cancel-cast it. 4. If you've landed both Corruption and Judgement on a target, you need to be casting your Shatter asap. Make use of the snare/silence combo. 5. Try to land your Judgement on a high value target, such as a Support, so that you can silence them - reducing their healing output in the process. 6. Don't be afraid to cast Inhibitor's Guard on an ally. It offers a high amount of shielding, and allows your melee Champions to play fairly aggressively on the front-line. This then frees you up to bombard from the back, repeatedly applying debuffs/your Shatter. 7. Use of Wuju takes practice, and experienced players tend to bait it often. Bad players tend to hit it constantly. It'll take time to find your groove as to when to use it, and when to avoid baited attacks. You'll often get a feel for it during the opening seconds of any match. 8. Remember that a triggered Wuju consumes your two debuffs. If playing aggressively, use Wuju to dive next to a Champion who has triggered it, and if they're silenced (especially) continue to hit them with more damage/re-apply your buffs for follow up Shatters. 9. If you're taking a beating and trigger Wuju, be sure to return back or near to your Support. There's no value in teleporting somewhere where your team can't help you. 10. Shatter deals solid AOE damage, and with Battlerite's can be cast on the move and multiple times. Use it to pressure grouped enemies, just be sure to save one in the tank for when you need to trigger your debuffs. 11. Kinetic Energy has as much value for escaping as it does diving and playing aggressively. Use it to quickly zip out of danger if you're out of Wuju/Inhibitor's Guard. 12. If you can, try to save Kinetic Energy for after your Ultimate so that you can immediately land multiple Shatters under the feet of those affected by Powers Combined.